Entertainment Earth Exclusive! Doctor Strange's mysterious Eye of Agamotto pendant now appears on a mug you can have in your very own home! Peer deep into the world of the arcane as you savor the mysterious liquid in your Doctor Strange Eye of Agamotto Amulet 11 oz. Heat Change Mug - Entertainment Earth Exclusive, and watch for the transformation to occur. Like the doctor's cape, the mug is colored red overall. It features a closed Eye of Agamotto when cold, but add hot liquid and the eye opens up! Fans of Marvel Comics' Doctor Stephen Vincent Strange will love this! Mug is made from ceramic and holds up to 11 ounces of liquid. Hand wash only. Not dishwasher safe. Do not microwave. Please note that this mug will not grant mystic powers. Measures 4-inches tall. Ages 13 and up. Entertainment Earth Exclusive! 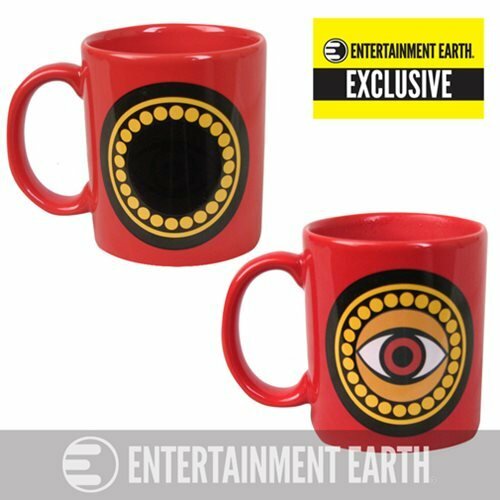 Doctor Strange's mysterious Eye of Agamottopendant now appears on a mug you can have in your very own home! Peer deepinto the world of the arcane as you savor the mysterious liquid in your DoctorStrange Eye of Agamotto Amulet 11 oz. Heat Change Mug - Entertainment EarthExclusive, and watch for the transformation to occur. Like the doctor's cape,the mug is colored red overall. It features a closed Eye of Agamotto whencold, but add hot liquid and the eye opens up! Fans of Marvel Comics' DoctorStephen Vincent Strange will love this! Mug is made from ceramic and holds upto 11 ounces of liquid. Hand wash only. Not dishwasher safe. Do not microwave.Please note that this mug will not grant mystic powers. Measures 4-inchestall. Ages 13 and up.